I’m writing this just above the 63rd parallel north. It’s 21:00, the sun is out and the air smells of sulfur. I am in Iceland. The geological features of this rock in the North Atlantic are stark. Steam and boiling water spews from the earth, cliffs rise from angry seas, and the weather changes from pleasant sun to blustery rain at the drop of a hat. It is a strange place, and its history is no less peculiar. It was occupied by British, Canadian, and American forces during World War II; waged the famous “Cod Wars” against the United Kingdom in the late ‘70s; gave asylum to Bobby Fischer; and is the only NATO member to not maintain a standing army. Historically, this small (but highly developed) nation of 300,000 has had an approach to foreign affairs at times as fiery and disruptive as its infamous looming volcano, Eyjafjallajökull (yep, that is how you spell it). While Iceland’s culture and history are firmly European, it geologically straddles the North American and Eurasian plates, and by virtue of its location and staunchly independent population, stands as an outlier to the cultures of both hemispheres. Iceland allows commercial whaling in violation of an international moratorium on the practice, and its national parliament, the Althing, has a self identified Pirate Party, which has pushed for granting Icelandic citizenship to Edward Snowden. This spirit (no pun intended) of flaunting convention extends to Iceland’s drinking culture as well. While most northern European states have a fairly liberal approach to alcohol consumption, Iceland, while far from being an island of teetotalers, stands with the United States as being the only other Western nation to have instituted total prohibition during the early 20th century. Furthermore, like blue laws that make it difficult to drink in Massachusetts to this day, modern Icelandic opinions and laws regarding hooch reflect this legal relic. 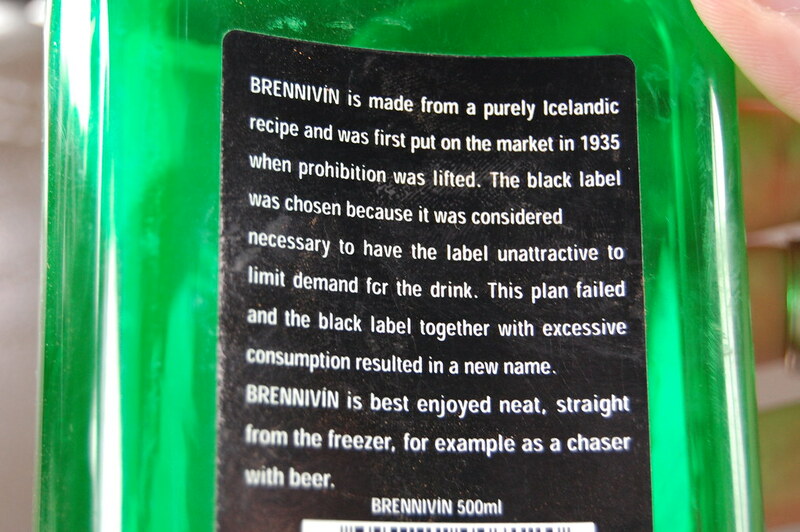 Except … prohibition in Iceland is not a long-forgotten relic. Icelandic prohibition went into effect on January 1, 1915 and existed in some form until 1989. Unlike American prohibition (which was enacted through the process of constitutional amendment), Icelandic prohibition was enacted through a referendum. The temperance movement and the Icelandic independence movement emerged at the same time and were, to some extent, related. Rejecting alcohol was seen as a repudiation of Iceland’s hard-drinking colonial overlords, the Danes. Icelandic prohibition applied to all alcoholic beverages for four years beginning in 1915. It was partially lifted in 1919 due to a trade dispute with Spain. The Spaniards wanted all the delicious North Atlantic cod being plucked out of Icelandic waters, but threatened a boycott if Iceland refused to import Spanish wine. In 1935, the ban was lifted on spirits and Icelanders could once again legally enjoy distilled beverages. But curiously, one beverage remained off limits: beer. Beer remained banned in Iceland and could only be brought into the country by airline personnel or foreign visitors. Not surprisingly, Icelanders innovated. Bars would serve bjorliki, a disgusting combination of half-strength beer mixed with a measure of vodka or other spirits to simulate real brew. This too was eventually banned. In 1979, the beer ban faced an unsuccessful challenge in the courts. Despite this failure to legalize beer, the public opinion pendulum swung the other way, and in 1980 Icelanders could again buy beer. But it was available in only one location — the duty-free shop at Keflavik airport. Finally, in 1988, after televised debates and a midnight vote, beer was permanently back on the menu. On March 1, 2016, 27 years will have passed since Icelanders have became totally free to pick their poison. Despite a legal framework for alcohol now consistent with most Western nations, the country still has a complicated relationship with booze. Alcoholic beverages (with the exception of 2.5% ABV “near beer”) can only be purchased in state run Vinbudins, of which a mere 49 exist in the entire country. In smaller cities, these stores have a limited selection, offer no cold beer, close around 6 or 7 pm, and keep strange hours. One Vinbudin I visited in Vik was only open from 4–6 pm Monday–Friday. At the location in central Reykjavik, I arrived approximately an hour before closing on a Saturday evening and had to queue for 15 minutes before entering the store. Furthermore, booze in the nation is also taxed not as a factor of price, but as a factor of alcohol percentage, meaning liquor is expensive. A premium gin such as Hendrick’s retails for about 9,390 ISK (about 73 USD), approximately double what you’ll pay for it stateside. Despite its history and high cost, Iceland is producing some truly world class and unique beer and spirits. What follows is a sample of the country’s wares. Like the beer options in most places, Icelandic beer can be split into two main categories: macro lagers and craft beer. I would advise against seeking out the former, which isn’t difficult because these brands are everywhere! Iceland’s major beer brands (Viking, Thule, Gull) produce rather straightforward Euro- and American-style lagers that showcase clever marketing more than an innovative or historically rich approach. They are not particularly off-putting or interesting, but they would be fine to wash the taste of fermented shark meat from your mouth (although this is traditionally reserved for Brennevin — see below). The craft brewing scene has two standouts, Einstök and Bruggsmiðjan. Einstök makes a very respectable wheat ale, pale ale, and porter. I was pleasantly surprised to see either draft or bottles available of their wheat and pale in most bars and restaurants. They also make use of the native bilberries in a very refreshing seasonal witbier. Einstök is now exported to a selection of states in America and the United Kingdom. Founded in 2003, Bruggsmiðjan produces an excellent dark lager, Kaldi Dark. While Einstök has taken a new world approach and has followed in the American craft beer tradition, Bruggsmiðjan is distinctly old world, following Czech recipes. Their beer is available at Vinbudins (as is Einstök) and can also be found at their very cool and laid back central Reykjavik bar, appropriately named Kaldi Bar. Birkir, the stronger of the two at 35% ABV, has a boozy and earthy aroma. It is bitter and herbal like Italian amaro, and also retains drinkability and mixes well with soda water or tonic for an easygoing cocktail. The liqueur Björk brings a pleasant sweetness that may evoke memories of childhood summer spent sipping Boylan’s Birch Beer. It is less herbal than Birkir, and while the sweetness masks some of the birch quality, it mixes wonderfully with soda water for a less intimidating foray into the “forest floor” realm of spirits. I’ve found that both Birkir and Björk play well with other spirits, particularly gin, and in small doses can work as an interesting riff on an otherwise classic cocktail. I’ve done equal measures of Sipsmith Gin and Birkir for a killer gin & tonic. There are fully Icelandic gins on the market. They are not high quality and definitely not worth their exorbitant price. The only Icelandic gin worth its sticker value is not even really Icelandic. Marketing itself as England Distilled and Iceland Chilled, Martin Miller’s Gin is a world-class spirit. While it is distilled in the UK, the gin is then shipped to Iceland where it is blended with spring water that has been filtering through Icelandic black basalt for nearly 800 years. This incredibly soft water is used to proof the spirit to its bottling strength, 40% ABV. I would recommend trying this gin in the purest expression of a cocktail: a dry gin martini with a twist. Finally we’ve come to Brennivín, otherwise known as Black Death, and also otherwise known as Iceland’s national beverage. According to the label, the spirit began being produced commercially after the prohibition on spirits was repealed. The black label was meant to dissuade consumers from buying it, but it had the opposite effect. Brennivín is considered an akvavit, and it definitely tastes like one. Icelanders claim to rarely drink it — only when they feel patriotic (like me and a Bud Heavy) or are around foreigners. Traditionally, it is an accompaniment to hákarl, fermented or aged (read: rotten) Greenland shark. Hákarl was famously described by celebrity chef and travel show star Anthony Bourdain as the worst thing he’s ever eaten. I’ve found Brennivín only palatable ice-cold and consumed quickly. It is caraway flavored, and feels a lot hotter than its 37.5% ABV would suggest (never a good sign). Its unfortunate dry and semi-dry history aside, Iceland’s beverage industry has stood out from the pack in recent years. No doubt much of this is driven by tourism, and there is a certain novelty factor to spirits like Brennivín now being available in the United States. However, the fact remains that each year we see more and more Icelandic beer and spirits pop up on both sides of the Atlantic. While I don’t expect to be ordering a round of Brennivín shots at my local bar anytime soon, it’s nice to know these products are available. Who knows, maybe Brennivín is the next Fernet Branca. James Sheehan is a homebrewer and cider-maker. When he’s not fermenting things he works for a Washington, D.C. based democracy education non-profit. He holds an MA in Terrorism, Security, and Society from King’s College, London.